I think it's pretty certain that long time readers of The Unknown Movies will have concluded that I love to write. Specifically, write about unknown movies and how great (or terrible) they can be. However, one question that might have come up in these readers' minds is if I ever have had the urge to write about other things. Well, I do have some ideas for stories that I may actually write up and post on this web site... eventually. But years earlier when I was a teenager, I had the urge to be another kind of writer - a journalist, to be exact. You see, when I was growing up in a small town, I would read the written works of a local entertainment reporter slash movie reviewer in the local rag. This reporter was an idiot, loving to death practically every movie he saw, as well as more often than not writing in a childish and unprofessional tone. Then one day, I saw my chance. The reporter had written an article that blatantly plagiarized from an article I had read in a major American entertainment magazine a few days earlier, several times copying word for word what the original article stated. So I photocopied both articles, and highlighted with a pen the blatant similarities. I then typed up a letter to the editor of the local paper, explaining what I had found and that I was sending him evidence as proof. I also enclosed samples of my own writing, in the hope that not only the plagiarizing entertainment reporter would be fired for his blatant plagiarism, but that the editor of the paper would see that I, a mere teenager, was a much better writer, and that I would be chosen to be the new entertainment reporter for the local paper. I enclosed everything in an envelope, addressed it to the editor, and put my correspondence in the mail after stamping the envelope. As the envelope went in the mail, I was filled with the belief that fame and fortune were just around the corner. I waited for a response, or at least for the entertainment reporter to suddenly disappear from the newspaper. And I waited some more. And more. But to my surprise, not only did I not get a response from the editor of the newspaper, the reporter continued writing for the newspaper, and continued doing so for many more years. To this day, I don't understand why nothing happened to the plagiarizing reporter. However, I do understand where my loss of faith in journalism started. Although I still had the dream of being a journalist long after that incident, it was slowly further eroded by coming across true stories of journalism misconduct. The most obvious example is with those tabloids found at the register at your local supermarket. I couldn't believe that reporters would constantly brand various celebrities with wild stories. If the stories were true, it was a gross invasion of privacy. If not true, it was even more distasteful, especially when realizing the reporters would not get punished. In fact, in more respectful areas of journalism, I've noticed that few reporters who report falsehoods don't get properly punished. For example, there is the case of Janet Cooke, a reporter for The Washington Post who in the early '80s wrote an article about a heroin addict who was only eight years old. The article provoked an uproar and a cry to help the child, but Cooke would not reveal her sources. But eventually, days after receiving a Pulitzer prize for the article and feeling pressure from other reporters finding holes in her official biography, Cooke revealed that she had made up everything in the article. She resigned, and I read one report years later that the only employment she could get was a minimum wage job as a cashier. It sounds like she was punished, but just wait a second. Several years later, Cooke sold the rights to her story to a major Hollywood studio, and the amount she earned from that was around eight hundred thousand dollars. Some punishment. Oh, I am sure that most professional journalists are responsible people, following strict guidelines that have them do stuff like verify sources and get all sides of a story. Still, when it comes to movies and television shows that deal with journalists, quite often you see a negative portrayal of them, portrayals that include journalists who are cold and unfeeling bastards who are determined to get a good story at any price. The reason for that is pretty obvious - it makes for drama that's more likely to push the buttons of the people in the audience. On the surface, The Mean Season seemed to be one more film depicting journalists in a negative light when I found a copy of it. But my research revealed it was based on a book by famed journalist John Katzenbach. This suggested to me that the journalist in this telling may not be a complete slimeball. The journalist in this movie is one Malcolm Anderson (Russell, Interstate 60), who has been working at the same Miami newspaper for years. Most of his reporting up to this point has been with covering local murders, and the endless reporting of these depressing crimes has taken its toll. In fact, he is preparing to leave the paper and move out of the city with his girlfriend Christine (Hemingway, Personal Best) to a more pleasant journalist climate in Colorado. Then shortly after Malcolm's latest murder article is published, he gets a call from someone claiming to be the killer. The caller expresses admiration for Malcolm's writing, and informs him that the murder was just the start of what will be a string of murders. The caller even gives Malcolm some information about the murder that only the killer and the police would know - information that proves to be correct when Malcolm does some investigation after the phone call. Naturally, when the police get wind of Malcolm having had contact with the killer, they demand cooperation, especially when they learn that the killer also promised to further contact Malcolm on a regular basis. Malcolm does cooperate with the police, but Malcolm also realizes he has a big scoop on his hands, one that has him as one of the star players of the story. Soon the reporting on the killer (who does indeed start to increase his body count) makes Malcolm a celebrity all across the country - which doesn't sit well with the killer. Although I have been writing as a hobby for years, and that I have a university degree in English, I have to admit that I am not an expert in the field of journalism. So I can't be one hundred percent sure that the various things that the character of Malcolm is seen doing on the job is an accurate depiction of what a journalist in his position would do. However, I know that most people who will see The Mean Season will not be journalists, so I can at least comment on how the portrayal will come across to the average Joe. Apart from the fact that Malcolm and other reporters are seen several times writing articles completely in upper case letters, the movie's portrayal of journalism comes off as pretty believable. Malcolm's base of operations was shot in an actual Miami newspaper office, so the environment has the right look. When it comes to depicting the people of journalism (not just Malcolm), the movie is fairly balanced. Shortly after the killer makes his first call, the newspaper staff has a discussion about whether to print the fact of the killer's call, and some staff are hesitant to give the killer the publicity he craves. On the other hand, there are some reporters who can't resist such a juicy and exclusive story. In fact, an associate of Malcolm (played by Richard Masur) convinces Malcolm to go ahead with the story by saying, "Reporters report," and "We don't make the news, just sell it." The prospect of such a juicy story, however, does sometimes make the newspaper staff commit acts that may seem heartless to outside observers. There's an interesting (and convincing) scene when the newspaper staff agree to hand over any evidence they get on the killer as long as the police wait several hours before releasing the information to other news agencies so that Malcolm's paper can report the scoop before anyone else. As for the portrayal of Malcolm, it too feels pretty authentic. When Malcolm gets the first call from the killer, he at first does not believe it, since reporters like him get plenty of crank calls. Though when the killer's information proves to be correct, he realizes that he is on a juicy story. He doesn't get carried away at first - his years of reporting have conditioned him to be objective. But the fame that comes eventually start him to slip up and make mistakes, causing him embarrassment. He also gets to see one murder scene leaving behind an orphaned child that, by the expression on his face, makes him finally realize what an awful thing the killer is doing. While the screenplay for The Mean Season does its share to make Malcolm a balanced yet convincing character, credit also has to go to actor Kurt Russell. His performance here is of utter restraint compared to some of his roles in other movies - which happens to be the correct choice. His character at the beginning is burned out and just wants peace. When the story starts picking up speed, his journalistic instincts make him at first careful not to get his emotions get in the way of reporting the facts. When things start turning dark for him both at work and at home, he may be numb, but his facial expressions clearly show emotions like embarrassment and regret. Overstating his emotions would be wrong for a journalist who has not gotten emotionally involved for so long. There are several other performances in the movie worthy of note. Richard Jordan (Valdez Is Coming) does well as the killer, putting an interesting spin on what could have been a stereotype. His killer is smart, but by the tone of his voice also shows fear of not being in control, sometimes stumbling on his words when the pressure starts. B movie actor William Smith (Seven) is also effective in a small cameo role towards the end of the movie. The first two-thirds of The Mean Season are the first two-thirds of what could have been a great thriller from the start and to the end. Up until the last third of the movie, the movie's story is gripping on multiple levels, showing (among other things) how journalism works and how it can be manipulated, as well as with the interest of what path the unpredictable killer would take next. Unfortunately, things fall apart in the last third of the movie. (WARNING: SPOILERS AHEAD.) You may notice that I only briefly mentioned the character of the girlfriend of Malcolm. That's because the character gets so little to do until that last third of the movie, with seemingly her only purpose in the movie is to get... oh, you guessed it? And once that predictable thing happens, we get stuff concerning Malcolm racing around in his car, jumping over an open drawbridge, and other stuff that would seem home in an action-oriented thriller. Then at the end of the movie, there is (you guessed it again) a scene where the believed-to-be-dead killer turns out to still be alive, leading to a man-to-man struggle while a thunderstorm is raging. My heart sank deeply watching this last third of the movie. All of this stuff seemed so brainless and out of place for a movie that previously seemed to have been made with brains. Was it decided by the studio that financed the movie that the movie needed more so-called commercial touches? I'm not sure; all that I know is that someone should have noticed that the last part of the movie didn't fit with the rest of the movie. 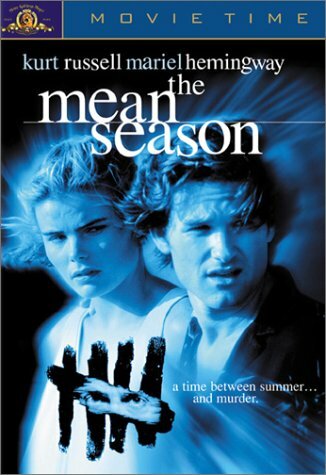 A movie like The Mean Season is hard to recommend as well as not recommend. There is some really good stuff here, but at the same time there is a significant amount of material that will infuriate anyone with taste and intelligence. The best I can do is put this movie right between "recommended" and "not recommended", and I leave it to you, dear reader, to decide whether what I have told you about the movie makes it sound appealing enough or not to your personal cinematic requirements.